Yes another cheesecake! I know! I know! I am obsessed! 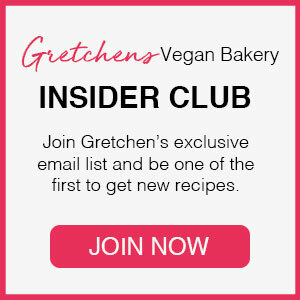 But if you have tried this new vegan base recipe for cheesecake you will know why! It is so versatile that (as you know) I have been adding everything but the kitchen sink to it to make tons of different fabulous combinations! 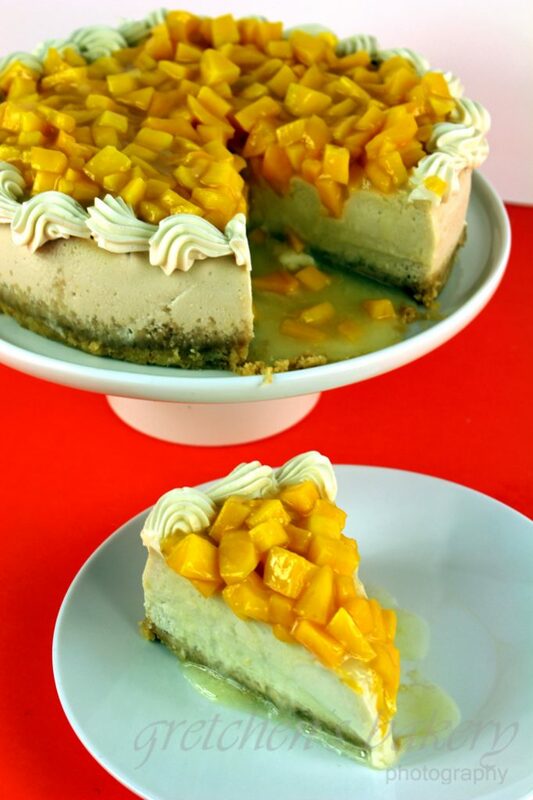 From Oreo Cheesecake to Fruity Pebbles Cheesecake I am going mangoes for this new recipe! Seriously if you have not yet tried it you are going to flip! Most vegan cheesecakes I’ve seen are using cashew cream as the base, but here I have created a No Nut, No Dairy, No Egg version of cheesecake that will have you (and your non vegan guests) amazed that this is not the real deal! Actually it is BETTER! I am not just tooting my own horn though, because a couple times now I have brought these cheesecakes to dinner parties and all teh guests (most non vegan) agreed that my cheesecake was better than any they had tasted before! So here I have summer on the brain with a classic vanilla cheesecake, graham cracker crust and fresh mango compote on top. Oh yeah, did I mention NO MIXER REQUIRED!? Umm, yeah it just keeps getting better! You will need a blender or a food processor though, but wait until you see how EASY Cheesecake making just got! Me! Almost as much as I love this new cheesecake recipe! Almost……. 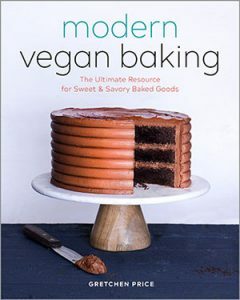 Pour batter into prepared pan and bake in a water bath in a preheated 335°F oven for 1 hour, then turn the oven off and leave the cheesecake inside for another hour. In the meantime you can make the Mango Compote by combining the first measure of sugar with the first measure of water and bring to a boil. Once the sugar water in the pot comes to a boil add the slurry and whisk smooth while bringing back to a full rolling boil to activate the cornstarch. Remove from the heat and add the diced mangoes, stir to coat well. Transfer to a bowl to cool completely then refrigerate overnight and top the cheesecake with it in the morning. Cheesecake must be kept refrigerated at all times in an airtight container for up to 10 days. Can Clear Jel be used in place of cornstarch? Can you please email me your mango mousse cake recipe? I ate it today. It was extremely delicious. Can’t get in in Pinterest or google. Something is wrong with the website. Thanks!! HI Maria, having some techinical errors with the site, and it seemed to happen while I was in Florida visiting my mom ( I just got back today) looking into it now thanks! How drastically does the taste change using apple cider vs lactic acid? As much as I’d love to have it to play with it(vegan mozz especially), it’s pretty pricey. My cheesecake ended up cracked on the top and edges. Any idea why? I made this and used ginger snaps for the base and strawberries for the top and it was THE BEST cheesecake I have EVER eaten. I have had cashew cheesecakes and they are too heavy. This was light and creamy and SOOOOOOO YUMMY. The peeps I made it for had no clue it was vegan and loved it. This one truly is guilt free. 8 portions and only 1 tub of tofutti cream cheese. Adding the tofu really lightens it up. Thanks so much for a fail safe recipe. YAY! thanks for the feedback! I too love this cheesecake (base) recipe can be used for just about EVERYThing! !